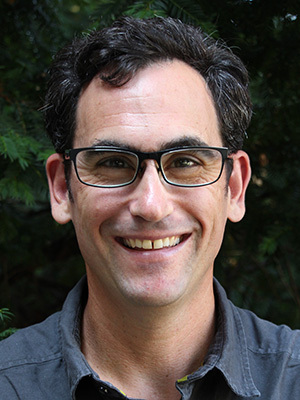 If you missed Monday’s Horticulture Section seminar, Managing expectations – The microbiome in agriculture, with Jack Gilbert, Department of Ecology and Evolution, University of Chicago, it’s available online. 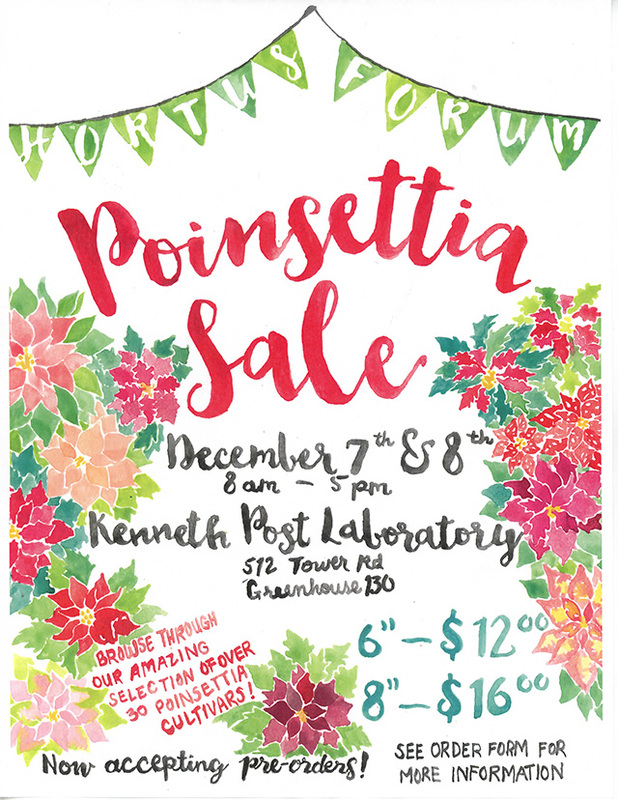 Hortus Forum, Cornell’s undergraduate horticulture club, will hold it’s annual poinsettia sale December 7 and 8. 7-percent discount for orders exceeding 9 items. Now accepting pre-orders. See order form for details. Proceeds support Hortus Forum activities. Our mission: Cultivating a positive social community which fosters a passion for plants and teaches the value of horticulture. Research Geneticist, USDA-ARS Grape Genetics Unit, Geneva, N.Y., it’s available online. Friday, we received the sad news that our colleague and friend, Robin Bellinder passed away unexpectedly. Robin Bellinder received her Bachelors from Michigan State University and her Masters and Ph.D. from Virginia Polytechnic Institute and State University. In 1984, she joined the Cornell University Horticulture Department as an Assistant Professor, with a program focused on weed management for vegetable crops. Robin was a national and international leader in her field. She was the author of more than 80 research publications and more than 200 publications focused on growers. 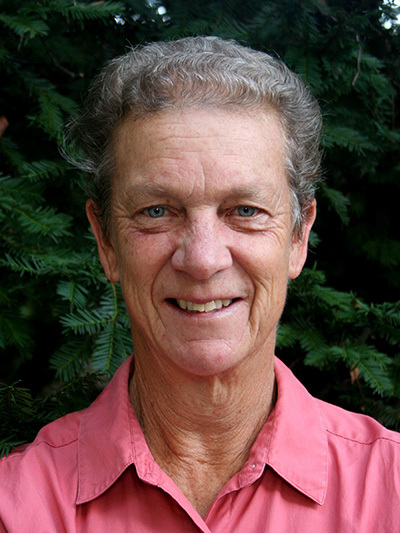 She was the past President of the Northeastern Weed Science Society, and in 2005 was named the recipient of Cornell’s College of Agriculture and Life Sciences award for Outstanding Accomplishments in Applied Research. She was mentor to numerous graduate students and advisor to many undergraduates. Despite her busy schedule she even managed to add teaching to her responsibilities and co-taught Commercial Vegetable Production. She was a tireless fighter for New York vegetable growers, always looking for new tools to manage weeds. Her research included all aspects of weed management, from traditional herbicides to cultural and chemical alternatives. She pioneered research in the weed suppressive ability of cover crops. A sabbatical leave to Sweden in 1991 introduced Robin to new and innovative European cultivation equipment that she brought back to New York. Robin worried about people, whether it was poor farmers in southern Asia or hungry families in the Southern Tier. She led the effort at Cornell to provide fresh vegetables from plots at the Homer C. Thompson research farm to the Food Bank of the Southern Tier. Robin realized that rather than fruit and vegetables being put in compost bins, they could wind up on dinner tables and feed hungry families. Since 2004, Cornell has donated more than 1 million pounds of produce from the Thompson farm. Robin was very involved in international agriculture and traveled throughout Central America and Asia. After a visit to India, Robin pioneered the use of backpack sprayers for small growers. She said “anyone who thinks farmers in India should control weeds without herbicides should spend an afternoon in a field there with a hoe”. Her work in India changed lives and she was elected a Fellow of the Indian Weed Science Society for her contributions to Indian agriculture. Please keep Robin’s family in your thoughts and prayers. A memorial service for Robin will take place on Saturday, November 21 at 3 p.m. at the Wagner Funeral Home, 110 South Geneva Street, Ithaca. Visiting hours will be held prior to the service beginning at 2 p.m. In lieu of flowers, Robin’s family suggests donations in her name to the Food Bank of the Southern Tier. 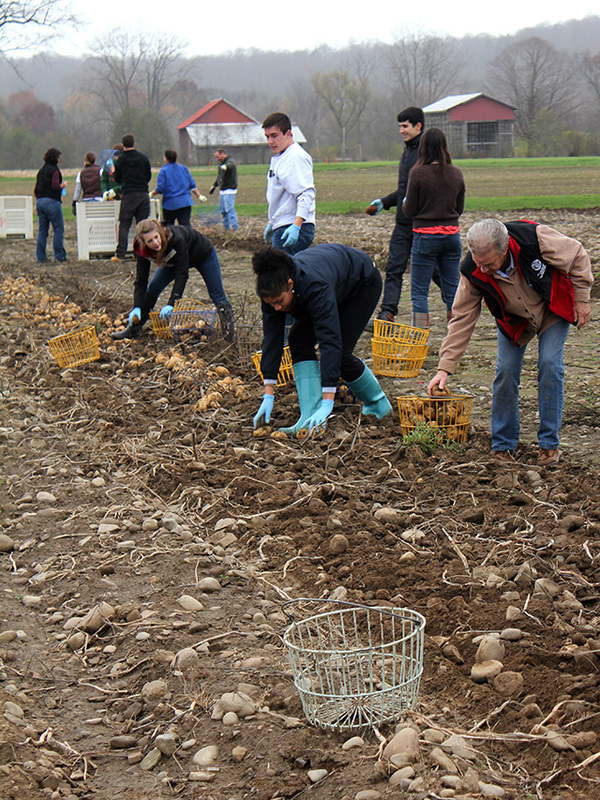 Robin Bellinder (right) with volunteers gleaning potatoes for the Food Bank of the Southern Tier at the Homer C. Thompson Research Farm in 2012. 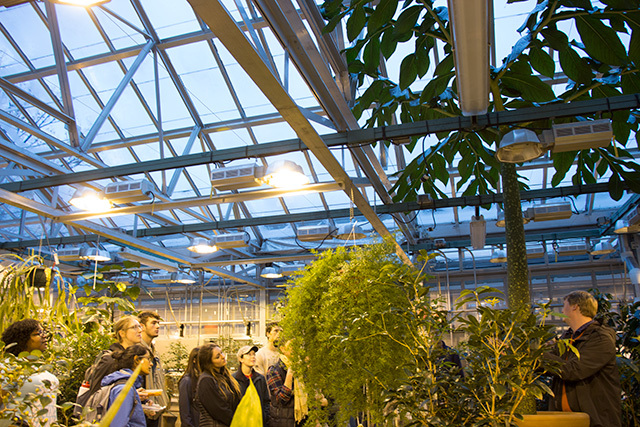 Students in Horticultural Science and Systems (PLHRT 1101) got a glimpse of what’s going on in the new Liberty Hyde Bailey Conservatory, Plant Science Greenhouses, and Kenneth Post Lab Greenhouse Complex on a walking tour led by Neil Mattson, associate professor in the Horticulture Section last Friday. Highlights included viewing what Cornell’s first-to-flower titan arum ‘Wee Stinky’ looks like during its vegetative stage, with its single leaf pressing the rafters (below). PLHRT 1101 students view ‘Wee Stinky’ in its vegetative stage. The orchard of the future: Higher tree densities, more automation [Fruit Grower News 2015-11-02] – “If asked what commercial fruit orchards might look like in the future – even up to a century from now – those who’ve studied orchards closely will give you a wide range of answers. The speculation begins below. 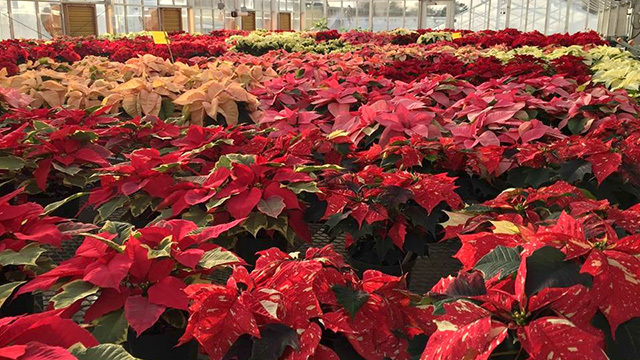 Greg Peck, assistant professor of horticulture at Virginia Tech [now assistant professor in the Horticulture Section in Cornell’s School of Integrative Plant Science], tackled this question with graduate students Ashley Thompson and Candace DeLong.” Read more. Making a Meal That’s Bred-to-Order [The Atlantic 2015-11-10] – “Michael Mazourek and Dan Barber can trace the roots of their unusual partnership to a winter squash. A few years ago, Mazourek, a vegetable breeder and professor of plant science at Cornell University, went to the Blue Hill restaurant in New York to sample the dishes that Barber, the chef, had made from the some of Mazourek’s newly bred organic vegetables. He was expecting a good meal, he recalls—after all, he could vouch for the quality of the raw ingredients—but he was blown away by the flavor that Barber and his colleagues had coaxed from the vegetables, particularly a tiny, tan variety of butternut squash called ‘Honeynut. '” Read more. Plant scientists tackle big data problems at workshop [Cornell Chronicle 2015-11-13] – Participants at the first Genomic and Open source Breeding Informatics Initiative (GOBII) workshop at the Boyce Thompson Institute (BTI) the week of Nov. 2 attempted to plan a one-size-fits-all solution to handling big data in plant research programs.Read more. State Agriculture Commissioner Richard A. Ball today announced awards totaling $1.2 million for 10 projects to grow New York agriculture through research, protection and promotion of the state’s specialty crops, which rank highly in the nation in terms of both production and economic value. Funding is provided through the Specialty Crop Block Grant Program and provides important assistance for research and grower education projects to boost competitiveness of New York farms and enhance long-term viability of agri-businesses. $105,568 to increase consumer demand for fresh, local vegetables year-round by supporting farmer entrepreneurs with the necessary business analysis tools to successfully enter the emerging field of controlled environment agriculture. $51,916 to help growers reduce pesticides by 30 to 40 percent and improve growers’ profitability by offering a series of one-day, in-depth training courses on state-of-the-art spray application techniques. $112,149 to evaluate management strategies of leafroll viruses and develop a comprehensive, integrated pest management (IPM) program to be disseminated to the local grape community to increase the overall quality of production and vineyard profitability. $109, 829 to help New York apple growers adopt precision management techniques to reduce loss and ensure that a higher percentage of Honeycrisp apples meet the quality criteria necessary for the fresh market. Cornell Cooperative Extension’s Lake Ontario Fruit Program will coordinate this project. $280,000 to educate consumers about the many environmental, economic, and health benefits of specialty crop consumption. $100,000 to increase the capacity of schools to procure and serve locally-produced specialty crops and help schools in carrying out their farm-to-school plans and initiatives. $90,000 to assist specialty crop industry groups in providing information, raising awareness and promoting the state’s specialty crops to buyers and sales leads at the New York Produce Show in New York City. $58,241 to assist consumers and commercial buyers to more easily search for and locate sources of specialty crop products by expanding the Pride of New York database and its functionality. If you missed Monday’s Horticulture Section seminar, What did they really eat? A critical analysis of the food value in the Three Sisters, with Jane Mt Pleasant, Associate Professor, Horticulture Section, it’s available online. Winter is a great time for farmers to rest, slow down the pace, and build new skills for the coming growing season. 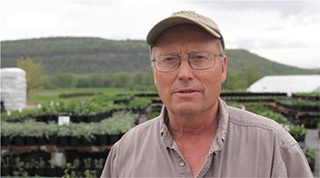 The Cornell Small Farms Program is pleased to announce the winter roster of online courses available through its Northeast Beginning Farmer Project. These courses help farmers learn from the latest research-based education. Since 2006, the program has offered high quality, collaborative learning environments online and each year educates hundreds of beginning and established farmers through these courses. Are there courses for me? From aspiring to experienced farmers, there is a course for nearly everyone. There’s a handy chart on our course homepage to direct you to the right courses for your experience level. What are the courses like? All of our courses consist of weekly real-time webinars followed by homework, readings, and discussions on your own time in an online setting. If you aren’t able to attend the live webinars, they are always recorded for later viewing. Qualify for a 0% interest loan! Participants who complete all requirements of one or more online courses are eligible to be endorsed for a 0% interest loan of up to $10,000 through Kiva Zip. Each course is $200, but up to 4 people from the same farm may participate without paying extra. See the course description page for more on the course learning objectives, instructors, and outline. View the calendar of course offerings. Courses often fill very quickly, so don’t miss your chance to sign up today! 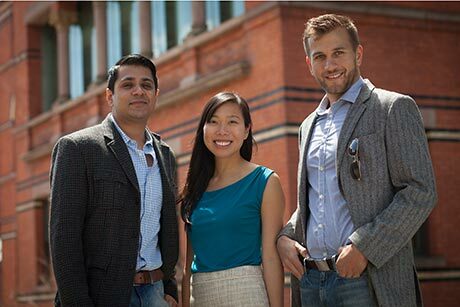 Uma Bioseed founders Abhijeet Bais, MBA ’15, Margo Wu, MBA ’15, and Brennan Whitaker Duty, MBA ’15, won $500,000 in the 43North incubator competition in Buffalo, New York, Oct. 29. Uma Bioseed – a Cornell student business startup formed in partnership with another Cornell startup’s technology – won $500,000 in the 43Northincubator competition in Buffalo, New York, Oct. 29. Eleven company finalists – whittled down from 11,000 registrants in 117 countries – met in a pitch competition to serve up why their business deserved the $1 million grand prize. The winner was ACV Auctions of Buffalo, which received the grand prize and one year of space at the 43North incubator on the Buffalo Niagara Medical Campus. Uma Bioseed will produce a cost-effective seed coating with stabilized organic enzymes to battle fungal and bacterial seed-borne pathogens. The solution can disinfect seeds as they germinate so that more crops thrive from sown seeds, increasing yield and farm income. Seed technology expert Alan Taylor, professor in the Horticulture Section of the School of Intergrative Plant Science, mentored the Uma Bioseed team.